Your St. Francis Sharks hosted their first ever on campus night game last night for homecoming at Strawberry Stadium. Santa Cruz won the game 14-12 as the Sharks two point conversion with 1:00 to go was stopped just short. The Sharks took a first half lead 6-0 after an 8 yard Andrew Seymour touchdown run. 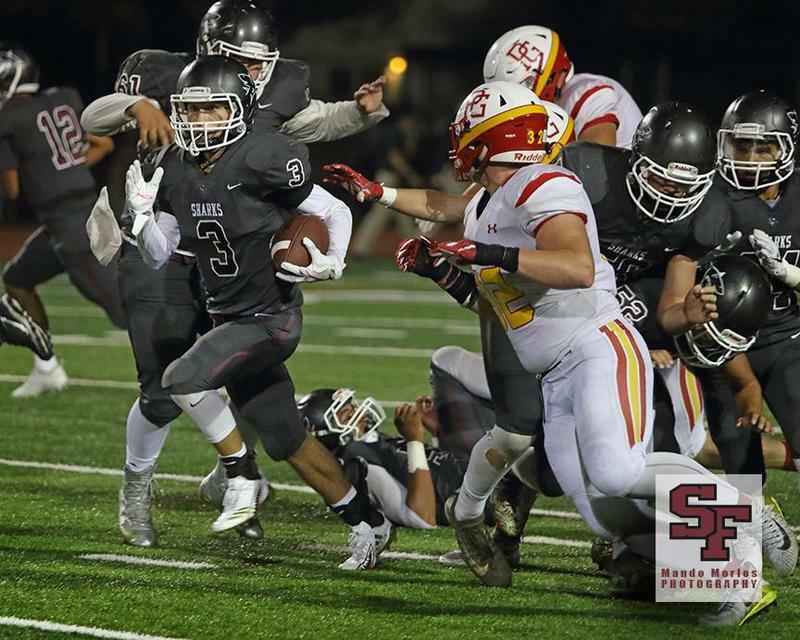 In the third quarter the Cardinals of Santa Cruz tied the game on a Demitrius Gallegos. In the 4th quarter Gallegos ran in another 2 yard touchdown and also ran in the 2 point conversion. The Sharks then went on a drive that ended with a 2 yard Aaron Soto touchdown run with 1:00 to go and then the conversion was stopped by the Cardinals. The ensuing onside kick was recovered by the Cardinals. The Sharks are now 4-4 on the season with games remaining at Monterey and senior day on November 3rd vs North Monterey County at 2 pm. Come out and support your Sharks. We'd also like to give a big thank you to everyone involved in making the first on campus night game possible.